SUMMARY: We present a case of hemifacial hyperplasia in an infant manifesting predominantly as lipomatosis and hemihypertrophy of the maxilla. To our knowledge, there is only 1 other case report in the literature demonstrating the MR imaging features of this condition. Our case was manifest almost exclusively as lipomatosis, largely lacking muscular hypertrophy/hyperplasia. Hemifacial hyperplasia is a rare developmental anomaly characterized by asymmetric growth of ≥1 part of the face. 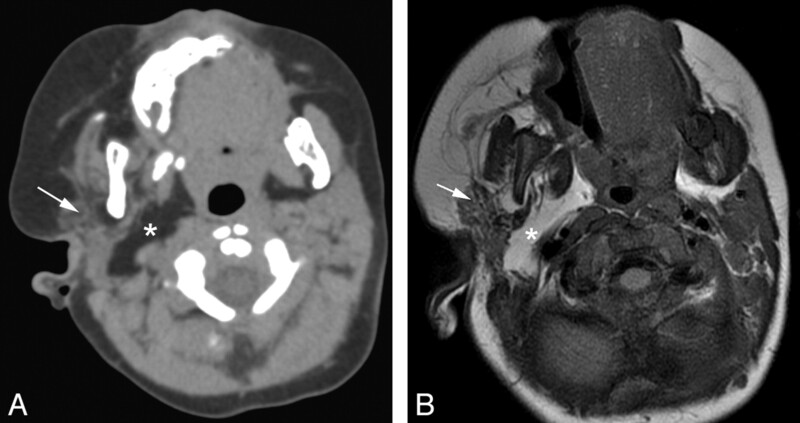 In this report of a female child born with facial asymmetry, CT and MR imaging revealed predominantly lipomatosis. The case suggests that hemifacial lipomatosis may be a subtype of partial hemifacial hyperplasia. We discuss the differential diagnosis of HFH and emphasize the importance of screening for embryonal malignancies. 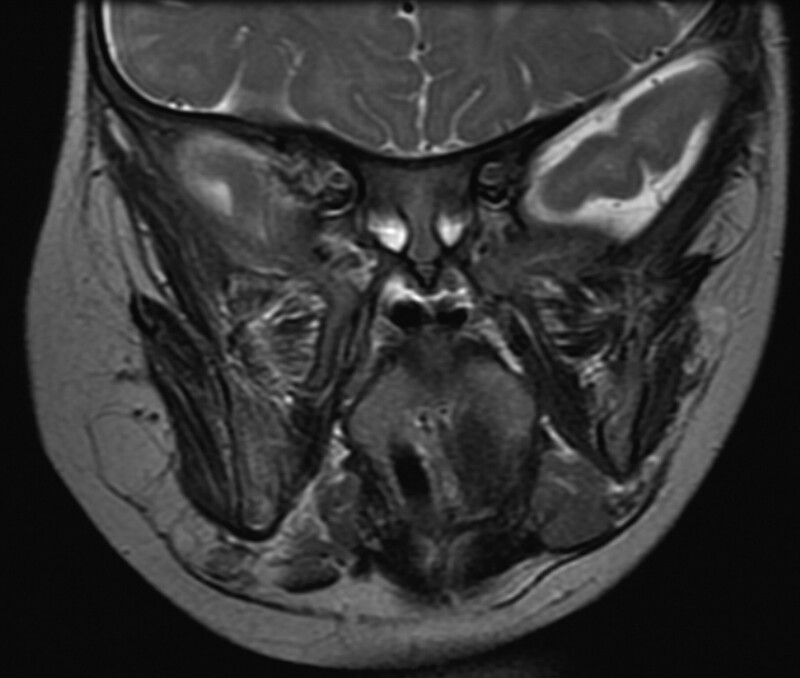 A 15-month-old female child presented to our department with right-sided facial fullness (Fig 1). The abnormality was noted at birth, and the child's parents stated that the fullness did not fluctuate in size. The right cheek appeared to grow at a rate similar to the left side. Physical examination was also remarkable for a slightly enlarged right auricle. There were no other significant medical problems. No biochemical or chromosomal abnormalities were detected. The child was otherwise healthy. A sonographic examination showed diffuse right facial adipose hypertrophy but no discrete vascular malformation. Surface rendering from a CT study performed on the patient at 15 months of age. CT examination at this time demonstrated predominantly increased fatty tissue on the right side of the face. The distribution of fat was largely in the malar region but also infiltrated the ipsilateral muscles of mastication and the parotid gland and extended into the ipsilateral parapharyngeal fat. The right parotid gland and muscles of mastication had a slightly marbled appearance, and there was enlargement of the right prestyloid parapharyngeal space (Fig 2A). These findings were demonstrated again on a follow-up MR imaging examination 4 months later (Fig 2B). The bony structures of the right face showed slight asymmetry, with hypertrophy of the right maxilla and the right lateral pterygoid plate. 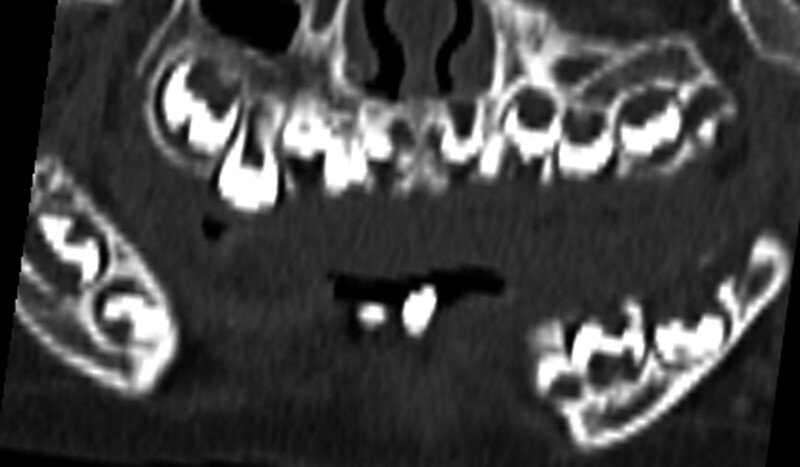 There was also subtle enlargement of the right zygoma and the right mandible (Fig 3). Regarding dental development, there was slight early rupture of the right maxillary deciduous canine teeth, and enlargement of the premolar and molar teeth was also noted (Fig 4). Axial CT scan through the maxilla of the patient at 15 months of age demonstrates mild hypertrophy of the right maxilla, lateral pterygoid plate zygoma, and mandibular head. Frontal curved reformatted CT scan of the maxilla shows early development and enlargement of the right maxillary deciduous teeth. MR imaging examination performed as a 6-month follow-up revealed stable and similar findings (Fig 5). No abnormal enhancement was identified. No discrete fibrous capsule to suggest an encapsulated lipoma was seen. The tongue appeared symmetric; however, accurate assessment was difficult because the patient was intubated for the study. Findings of an MRA examination were within normal limits, and no intracranial abnormalities were demonstrated. The child was otherwise developing normally and achieving normal milestones. Coronal T2-weighted image of the patient at 2 years of age demonstrates stable findings similar to those in the earlier studies. Note the marbling of the right masticator muscles. HFH was first described by Meckel in 1822.1 It is a rare morphologic developmental anomaly characterized by asymmetric growth of ≥1 body part. Its true incidence is unknown and, to our knowledge, has not been published, and very little about this syndrome has been published in the radiology literature. Although it is often called HFH, it may be more accurately termed “hemifacial hyperplasia” to reflect the underlying pathology.2,3 Little is know about the etiology of this condition. Various theories, none clearly favored, have been proposed. These include vascular lymphatic, hormonal, and asymmetric development of the neural fold, with hyperplasia of neural crest cells.3 It is a condition that appears to affect the derivatives of the first pharyngeal arch,4 though the middle ear structures seem spared. The extremely rare Proteus syndrome, suspected as the primary condition in the historic “elephant man,” causes a progressive overgrowth of all soft tissues and bones, including the skull, not limited to the region of isolated hemifacial hyperplasia. Patients with Proteus syndrome will often have involvement of the hands and feet and veracious epidermal nevi.7 BWS is a congenital cancer-predisposition syndrome associated with macroglossia, macrosomia, ear pits or ear creases, and midline abdominal wall defects. The associated hemihypertrophy seen in BWS may represent the mosaic form of macrosomia.8 The hemihypertrophy in neurofibromatosis type 1 can be due to even subtle plexiform neurofibromas and/or skeletal dysplasia. When vascular malformations result in facial asymmetry, it may be due to the bulk of abnormal vessels alone or combined with induced hypertrophy due to local increased vascular flow and local lymphedema.9 Occasionally, hemifacial atrophy (Parry-Romberg syndrome) can give the false appearance of hemifacial hyperplasia on the normal side, though these patients present later, between 5 and 15 years of age. Our case, similar to a previous case report,11 demonstrated lipomatosis as the dominant feature and lacked significant facial musculature hyperplasia. Hemifacial myohyperplasia is a proposed newly described separate entity in which facial muscular hyperplasia is the dominant feature.3,4 This may explain the lack of the nasal deviation toward the affected side in our patient but rather deviation to the opposite (normal) side. Nasal deviation toward the affected side may be observed when the facial musculature around the nasolabial fold is involved and when the hypertrophied turbinates cause nasal septal deviation.4 The teeth, mandible, and maxilla should be carefully scrutinized for deformities to help one reach the correct diagnosis. This is especially important if only lipomatous overgrowth is seen initially. Hemifacial hyperplasia is a rare developmental condition of asymmetric growth of ≥1 body part. 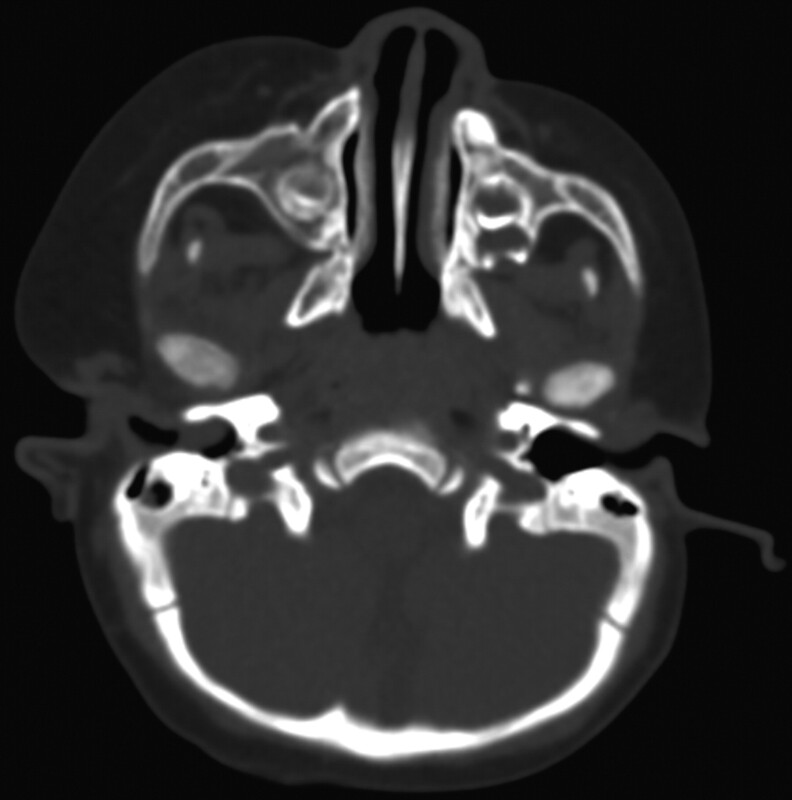 MR imaging and CT illustrate hemifacial lipomatosis as the dominant feature, suggesting that it may represent a subtype of partial hemifacial hyperplasia. Accepted after revision July 15, 2009.